There are fifteen categories for the award: Exceptional Nurse, Exceptional Employee, Empowering Manager, Customer Focused Physician/Provider, Service Excellence Advisor Team, 1st Year Service Excellence Advisor, Service Excellence Mentor, OASIS Team, DO IT Improvement of the Year, Super Coach, Program Director, Service Excellence Council, Inspiring Administrator, Medical Clinic of Choice and Hospital Provider of Choice. 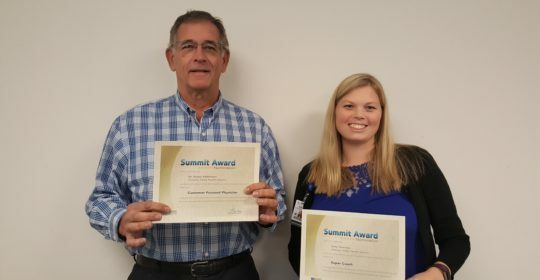 Artesian Valley Health System is pleased to announce recipients of two 2017 Pinnacle Achiever awards, Dr. Seeley Feldmeyer and Kelly Thornton. Dr. Seeley Feldmeyer was selected for the award as one of the top Customer Focused Physicians/Providers. Kelly Thornton, Human Resources Director, was selected for the award as one of the top Service Excellence Super Coaches. Pinnacle Achievers will be honored at the HealthCare Service Excellence Conference in January 2018. They are also finalists for the prestigious Summit Award which is awarded to one recipient in each of the fifteen categories. Summit Award recipients will be announced at the conference as well. Congratulations Kelly! Glad your hard work has been acknowledged. So proud to know the wonderful recipients of these awards! Way to go, friends!